September certainly begins cooler than August, but not drier. Indeed, the cold front that arrived a few days ago has already brought well over an inch and a half of rain to south-central Minnesota, including about an inch of precipitation late yesterday and early this morning. We might stay dry from now until mid-week of next week, and dare I say high temperatures should remain in the comfortable, much deserved low to mid-70’s. One of the pleasures of early fall in Minnesota is that temperatures are comfortable enough to allow for longer forays into nature while there is still lots of nature to be had; in other words, early fall is a busy time for Mother Nature. More and more monarch butterflies are flying high overhead just about everywhere we look as many of our fall-blooming wildflowers are approaching their peak. Migrating songbirds from up north fill our forests with chirps and squeaks, adding to the cacophony of half-sounds and throaty garbles made by our fledging residents. But while these happenings are to be enjoyed perennially, they can also cause us to continually look ahead and perhaps even dread their implied seasonal finality. Sometimes, then, what is needed is a giant, blatant “STOP” sign. Something that allows us to cease worrying about the coming changes and instead focus on the here and now, even if only for a short while, before moving ahead. Gray Treefrogs turned out to be my “STOP” sign this week. These small amphibians, not march larger than an inch in length, are quite common in many parts of the state and can be found from mid-May through mid-October. During the summer, their high-pitched trills combine with the vocalizations of crickets and katydids to form a nocturnal symphony familiar to most Minnesotans. As the weather begins to cool in the fall these frogs sing less frequently but are nevertheless equally present, and for some reason late August and early September seem to be some of the best times to actually see them. They can change the color of their skin from light gray to dark brown to bright green in order to camouflage themselves with their surroundings, which in most cases is a leaf or tree bark. 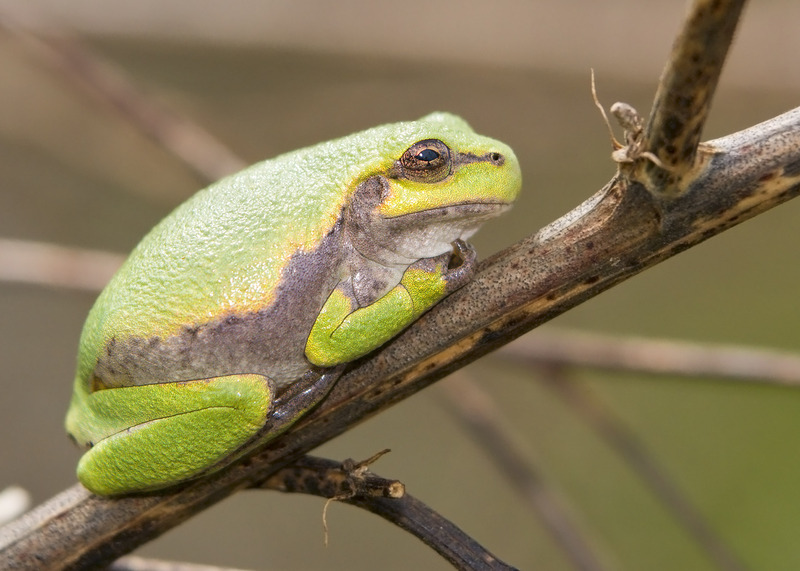 Below are photos of two different treefrogs, both belonging to the same species. 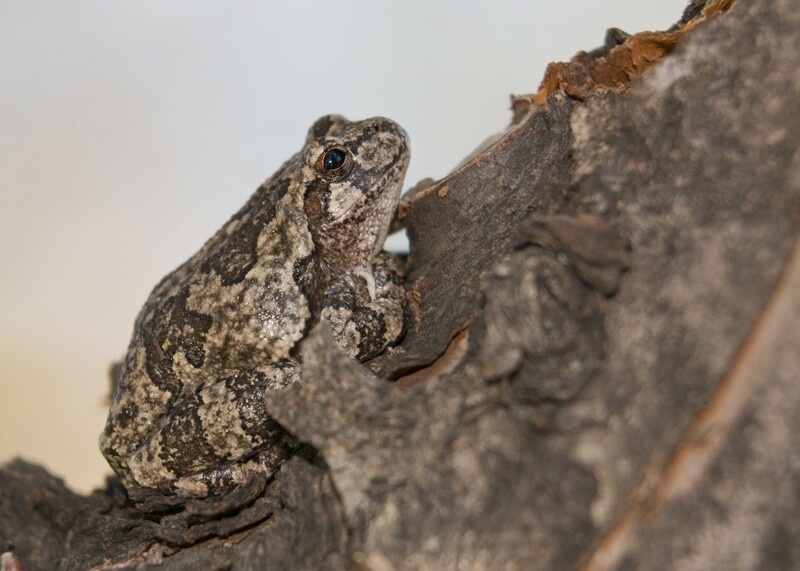 Gray Treefrog camouflaged with bark of crabapple tree in front of Interpretive Center, 8/30/10. Gray Treefrog camouflaged with nearby milkweed leaves at edge of Jim Gilbert Teaching Pond, 9/1/10.